Mark your calendars! On June 23, 2018 the latest Salesforce Marketing Cloud release goes live. In this blog post, we will highlight some of the new, user-friendly, integrations and features here. If you need to delve deeper and know your APIs from your SOAPs, please visit this Salesforce documentation page for the Salesforce Marketing Cloud June 2018 release. This release introduces a two-step login, for all customer logins to Marketing Cloud except DMP, Data Studio, and Social Studio. With this two-step login, you enter your username on the first login screen and click next. The next login screen is where you enter your password. Because this login method helps the backend system, it improves the overall performance of the platform. Advertising Studio clients can now harness the power of Marketing Cloud, Sales Cloud, and Pardot data to make LinkedIn advertising more effective. If you are a Command Center client, you can now use three more channels to monitor your brand. This release supports Chat (Live Agent and LiveMessage), Email and Phone. Command Center lets you view the number of new and closed cases by channel, see the total SLA for individual or all channels and the top performers on your team. Customers who use Content Builder to create emails, and who have Google Analytics 360 integration enabled, can now view web metrics in the Journey Analytics Dashboard. This feature helps you to understand how email content drives web behavior. With this setting enabled, new utm parameters are appended to the URL when a subscriber clicks links to the content. The Content Builder AssetID for a content block populates the utm_content parameter and the link alias associated with the content block is appended to the utm_term parameter. To enable content tracking for a journey, you need to select content tracking in the Journey Builder settings. Organize Journeys directly from the dashboard. You can create, rename and move Journeys. You can also add a journey to a folder after you save it by clicking organize. New error messages added to the Journey Builder Validation framework. Hide tiles or add previously hidden tiles from the Journey Analytics dashboard, so you will see only the Google Analytics 360 metrics that are important to you. A new REST resource for all Journey Builder API users provides information about contacts and the journeys they are currently in. 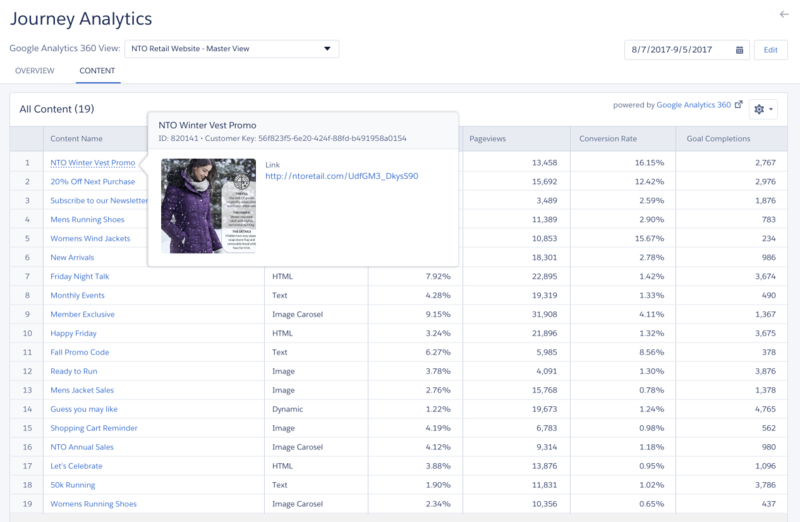 DMP Publish Macro: adds DMP parameters to a Web Analytics Profile when adding a URL in a post, so you can build and target audience segments in DMP based on website traffic from published content. Instagram Business account: Instagram business accounts supported across Command Center, Social Studio, Social Studio Automate, and Social Studio Mobile. This gives you access to more analytics, carousel album media, tagging images and more. Tag Users, Business Profiles, or Locations in an Instagram Post: Add the image to a post and right-click in the image. Enter the Instagram username, business profile name, or location you want to tag. You can use this to measure the effectiveness of your community management and service organizations. Litmus has been integrated in Email Studio, so Litmus previews for over 70 clients, browsers and devices are now avasilable in Preview and Test for Content Builder emails in Email Studio. Interaction Studio is a new Marketing Cloud Solution that reacts to the real-time behavior of consumers as they interact with a brand’s owned channels. Interaction Studio customers can find it in the Marketing Cloud primary navigation bar. Register for the Salesforce Marketing Cloud June 2018 Release webinars! Join the Salesforce June release webinar on June 19th to get an exclusive look at the new features. For Social Studio, there’s a separate webinar on June 26, 2018.